Mango Milk shake is very tasty and it simple recharges your body. Person who even don’t like mangoes will definitely love to have this drink as this is very sweet, juicy and the shake made with the king of fruits. 1. Chop the Mango pulp into small pieces. 2. Take a Blender and add the mango pulp into it. Add Milk, half portion of pomegranate seeds, chopped dry fruits and honey /sugar/jaggery as per taste and according to the sweetness of the mango. 3. You can also add ice cubes and pinch of saffron if you want. 4. Blend everything till smooth. 5. 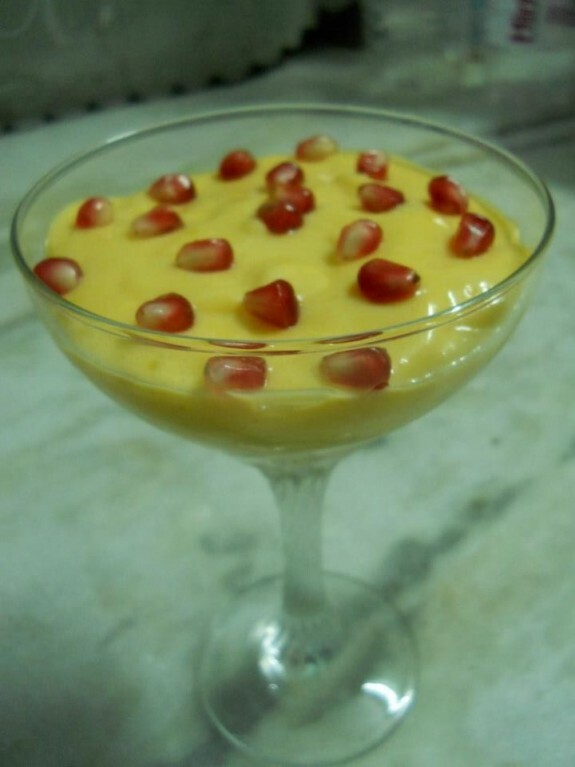 Serve the mango shake in a long glass and refrigerate it for few times. 6. Serve it with pomegranates on the top.